The San Diego chapter of the Council on American-Islamic Relations Tuesday announced the formation of a “Forum on Religious Freedom” in response to President Donald Trump’s executive order on immigration. CAIR San Diego also asked Muslim community members who believe their rights have been violated to contact local police and CAIR San Diego at (858) 278-4547 or file a report online at: ca.cair.com/sandiego. 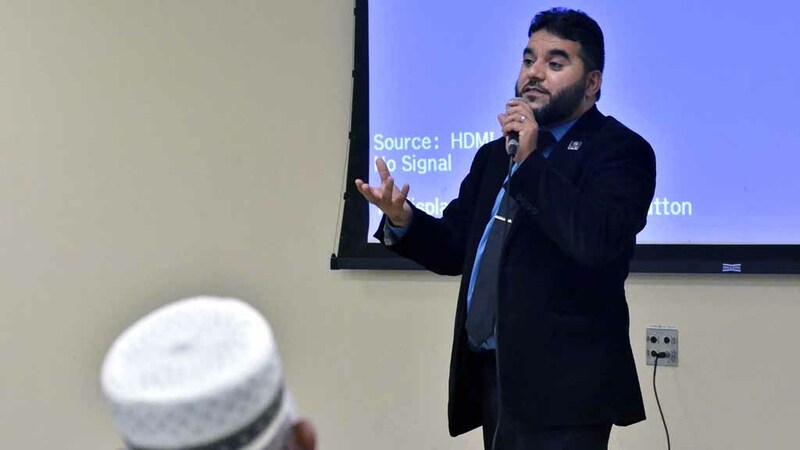 The forum’s goal is to create a countywide coalition and unite a group of organizations, clergy, elected officials, businesses, educational institutions and individuals, according to CAIR San Diego Executive Director Hanif Mohebi. “The focus of this group is going to be to make sure that the American-Muslim community is not marginalized, that the American-Muslim community is not targeted, that hate, bigotry, Islamophobia is not accepted,” Mohebi said at a news conference at a Clairemont area mosque. “We are going to work day and night, beyond this presidency to make sure that such things never happen to begin with,” he said, while flanked by dozens of coalition members who have pledged support for the forum. Mohebi said they would be organizing educational forums and town hall meetings, reaching out to legislators, setting up an emergency hotline and establishing a $200,000 legal fund. “We’re already getting calls from national, from our other chapters, to duplicate this effort, but it is a project that has started in San Diego,” Mohebi said. CAIR is the nation’s largest Muslim civil rights and advocacy organization. Trump’s order, signed Friday, suspends all refugee entries for 120 days, indefinitely blocks all Syrian refugees, and bars entry for 90 days to all immigrants from Iran, Iraq, Libya, Somalia, Sudan and Yemen. Andrea Guerrero, executive director of Alliance San Diego, said her organization was standing up with its Muslim brothers and sisters because standing down was not an option. A town hall meeting is scheduled for Friday at 6:30 p.m. at the San Diego Islamic Center in Clairemont. CAIR San Diego asked Muslim community members who believe their rights have been violated to contact local police and CAIR San Diego at (858) 278-4547 or file a report online at: ca.cair.com/sandiego.